Because the description sounded so great I opted to ignore the thing about having to climb 213 steps as well as the fine print: "Parts of this tour will not be enjoyed by those afraid of heights or confined spaces." The first spiral staircase from the ground floor of the cathedral up to the base of the roof was steep, but the stone steps themselves were wide and fairly uniform. There was also a wrought iron railing to hang on to. From there we headed outside onto the roof and as you cans see from the photo below we're still smiling...fools that we are! The views were superb and everyone stopped to take a few photos and catch their breath. So far so good. Next stop was inside the roof to view the 'bones' of the cathedral. Two things struck me as we entered this space. One: the intense smell of a combination of wood and a thousand years of dirt and dust, and two: the tunnel-like space seemed to go on forever. To reach the belfry we had to walk the entire length of the nave on the narrow wooden catwalk. Below our feet we could see the inverted arches of the Gothic ceiling. Next stop was the ringing chamber that is below the 16 bells in the belfry. In this short video our guide, Mike Cox, explains the origin of the term 'dumb bell'. Next stop is the belfry. Getting there caused the adrenalin to surge and my heart pound because we first had to go down a dozen steps inside a claustrophobic, stone circular stairway and then climb up an equally confining stairwell that was so steep it was more akin to climbing a ladder. It was also quite dark and unfortunately neither John nor myself stopped along the way up or down to take a photo. Yup. You heard correctly. We did it twice. Up. And. Down. I searched the internet for photos to share, but only came across this one image. The lovely young woman may be smiling, but I doubt we were! Why? Our age difference. Our physical ability (or lack thereof) and because the passageway was quite dark. The doctored image below is more realistic as to what we really encountered. Eventually we reached the top of the tower and when one of the guides asked if we'd like to pose for a photo I didn't argue. 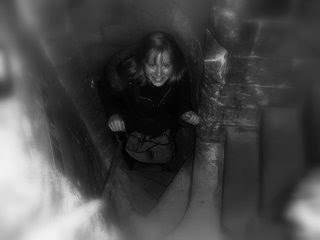 I'm grinning like a crazy person only because I couldn't stop thinking about how we had to venture back into that dark tomb coffin staircase in order to get back down. Me scared? Nah. Terrified is more like it. 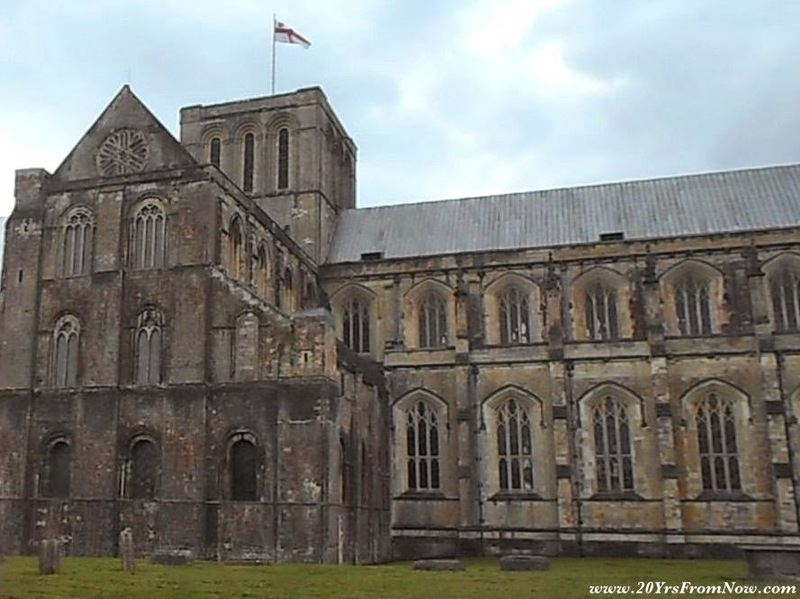 "We did the Tower Tour of Winchester Cathedral yesterday. I can't believe that Dianne did it. The first part of the tour took us above the main ceiling to a catwalk among the roof beams. Pretty amazing. The guide said they estimate they used the equivalent of 18 miles of oak timber for the beams and roof supports. "We then entered the Bell Ringer's Chamber and from there had to climb the narrowest, steepest spiral staircase you could imagine up to the belfry with its 16 bells. Next it was higher still to the roof of the central tower. "We then had a safety lesson on how to climb back down. There was only room for half the length of your right foot on the wedge shaped stairs, and you had to turn your left foot sideways on the same step, then reach down to the next step. 213 steps in all, with a rope on one side to hang onto, in virtual darkness inching down one step at at time. Sure got the old ticker going! "It has been one of the highlights of the trip so far, but I'm not sure I would do it again." John also joked (once I was back down on terra firma, of course) that he had visions of me having to be air-lifted off the top of the cathedral. Funny guy. Who is he kidding? I wanted my certificate...I earned it! Moving on to another adventure - namely the Winchester Farmers Market. Held twice a month on the middle and last Sunday from 9 AM to 2 PM it is the largest regular farmers market in the UK with up to 90 stalls attending each market. We really just went to see what it was like, but the variety and quality of foods soon had us drooling and before we could say 'lunchtime' we had three shopping bags loaded with British lamb chops, bread, veggies, cheeses and even a few sweets. The creamy mature goat cheese seen on the left below melts in your mouth. We reluctantly bypassed the fresh sea food - maybe next time. As well as these tasty cakes and squares. The lady standing next to me as I snapped this photo commented these mushrooms looked like a bouquet of flowers. Another stall of breads and pastries that we regrettably passed over. We did buy some cheese from this man, however. He sells a combo of cheddar and parmesan. Mmm! Can't wait for pasta night. We're having lamb chops this evening thanks to this farmer. It was tempting to just stand close to this vendor's goods and inhale. Check out the size of those scones (top right). We showed more self restraint at this booth. We did. Really. Have you ever seen rainbow chard? Named obviously from its multi coloured stocks. Can you believe I turned down a sample of fudge? I did! 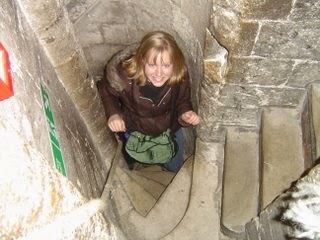 An image of me crawling back up to the belfry probably had something to do with it. The same image helped me walk past this table! Had it been closer to noon I doubt anything could have stopped us from trying this pizza. The aroma from the wood fired oven was AMAZING! As we're unfamiliar with 'purple sprouting' (seen on the bottom left) we had to try it. It's a cousin to broccoli and we were instructed to steam both the purple top and green stem and to 'waste nothing'. John noticed this vendor had chocolate cake made with beetroot and because he remembered his mother making a chocolate cake with sauerkraut he tried a sample. The woman joked about her version holding its own, but she needn't worried. John said it was delicious. He bought a small loaf (2nd from right) while I opted for the lemon. Can't wait to sample them. Another item we purchased was a round loaf of bread made with spelt flour. We were home before twelve, had a light lunch and then while I stayed behind to write this post John took Poppy for a walk.